Гундогар :: A New Great Lake — or Dead Sea? A New Great Lake — or Dead Sea? Turkmenistan intends to create a huge lake in the desert by filling a natural depression with drainage water. Critics say it’s a bad idea that could even spark a war. Bone-dry and as forbidding as California’s Death Valley, the windswept, 120-kilometer-long Karashor Depression — a natural bowl speckled with the ash-gray, mica-laden sand that gives the Karakum, or “Black Sand,” Desert its name — might seem the last place in the world to put a lake. But on a fine day in October 2000, some 450 kilometers south of Karashor, President Saparmurat Niyazov leaned against a spade and breached a few-meters-wide earthen dam. Laborers took over, and soon water was gushing into the initial segment of a canal intended to fill Karashor to its rim. Golden Age Lake, the late president said, would become “the symbol of revival of the Turkmen land,” covering 3500 square kilometers — nearly the area of Utah’s Great Salt Lake. With that gesture, Niyazov — known as Turkmenbashi, or “Father of the Turkmen People” — launched one of the most grandiose water projects ever undertaken. According to the plan, two canals that bisect the country will funnel runoff from heavily irrigated cotton fields into Karashor. 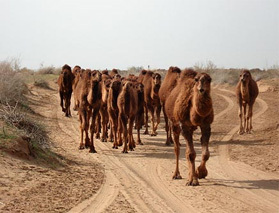 The USD6 billion project is designed to drain swamps and combat the buildup of salt and other minerals that have degraded three-quarters of Turkmenistan’s arable land and eroded renowned archaeological monuments. “The lake will solve many problems,” says Paltamamed Esenov, director of the National Institute for Deserts, Flora, and Fauna in Ashgabat. Turkmen officials predict that the project will reclaim 450,000 hectares of waterlogged agricultural fields and create a habitat for migratory birds and an inland fishery. Next month, Turkmen engineers say they will complete the mammoth effort’s first phase: excavation of the two “collector” canals, each hundreds of kilometers long. Water apparently has already begun trickling into Karashor. “We are carrying out a unique, pioneering project,” says a senior engineer at the Turkmen State Water Research, Production, and Design Institute in Ashgabat, which leads construction of Golden Age Lake. “Everything we are doing is aimed at increasing agricultural productivity,” says the engineer, who requested anonymity after agreeing to be interviewed without permission from Turkmenistan’s Ministry of Foreign Affairs. But Golden Age Lake has unleashed a torrent of criticism as well. “There’s no sense in this,” says Timur Berkeliev, a geochemist who coordinates the Worldwide Fund for Nature’s Econet project in Turkmenistan. He and others are skeptical of plans to purify the runoff, laden with pesticides and fertilizers, and contend that the lake will become an artificial Dead Sea. “Trying to find value in this lake may be like trying to put lipstick on a pig,” says Michael Glantz, director of the U.S.
National Center for Atmospheric Research’s Center for Capacity Building in Boulder, Colorado. “A bad idea, even for the best of intentions, is still a bad idea.” Some experts believe that runoff will be insufficient to fill the lake, as the drainage water will evaporate or seep into the desert through unlined feeder canals. That prospect raises fears that the lake could trigger a water war. Some observers worry that to prevent Golden Age Lake from running dry and to dilute tainted water, Turkmenistan might top it off with fresh water from the Amu Darya, a river on the border with Uzbekistan to the north. Uzbeks rely on the river for irrigation, and their leaders have said they would not tolerate a reduced share of the Amu Darya. “The lake project has incredible geopolitical implications,” says Johan Gely, who works on water issues in central Asia for the Swiss Agency for Development and Cooperation. The senior water engineer insists such fears are unfounded: “Every drop of the Amu Darya is valuable, and nobody is planning to use this water for Golden Age Lake,” he says. Some see a window of opportunity to coax Turkmenistan to reconsider. Niyazov died in December 2006, and his successor, Gurbanguly Berdimuhamedov, has not yet spoken publicly about the project. Foreign leaders have remained mum as well, perhaps in deference to Turkmenistan’s growing clout as owner of the world’s fifth largest natural gas reserves. In the meantime, Berdimuhamedov has promoted a gradual opening of the isolated country. “The leadership is now sensitive to world opinion,” says Berkeliev. There might be one last chance, he says, to persuade authorities to convene an international scientific review before irreversible steps are taken to fill the lake. “This is the right time to do something,” he says. Centuries ago, central Asians learned how to make the most of the region’s scarce water with networks of underground canals that conserved water for irrigation and drinking. “The tragic irony is that this region was home to one of the largest and most efficient irrigation systems in history, until the Mongol invasion destroyed much of the network,” says Peter Sinnott, director of the Caspian Project at Columbia University. Josef Stalin managed to outdo the Mongols. During the Cold War, when central Asia was part of the Soviet Union, Stalin’s water managers cooked up a notorious fiasco. In the 1950s, they began to divert massive amounts of water from the Syr Darya into a network of canals to irrigate cotton fields in Uzbekistan. The Syr Darya is one of two main sources of water for the landlocked Aral Sea; the river’s reduced flow resulted in the Aral’s shrinkage to less than a quarter of its original surface area. Soviet planners were pushing cotton in Turkmenistan as well, and in 1954, work commenced on the Karakum Canal, which would feed water from the Amu Darya — the other big Aral Sea source — into the Turkmen heartland. At 1375 kilometers in length, the Karakum waterway, completed in 1988, is the world’s longest irrigation canal. It has been a boon for agriculture — it tripled the arable land in its vicinity — and provides water to the capital, Ashgabat. But it has a dark side: A sizable fraction of the water that enters the canal (15 per cent to 50 per cent, depending on whom you ask) seeps through its unlined bed into the surrounding soil. The hemorrhaging created a patchwork of ponds and swamps and has exacerbated salinization. As the ground became waterlogged, the water table rose, bringing salts — primarily sodium sulfate — to the surface by capillary action. With evaporation, the brine crystallizes into mirabilite, a corrosive mineral that ruins oases and poisons fields. “Several kilometers to the left and right of the canal is a death zone,” says a Turkmen government scientist who asked to remain anonymous to keep his job. “If you step in the extremely salty water, your shoes are destroyed within a week,” adds a Western technician in Ashgabat who has visited the construction site of Golden Age Lake. That hasn’t stopped Turkmen authorities from forging ahead with a solution: the resurrection of a 1970s idea to divert Turkmenistan’s irrigation runoff into Karashor, near the border with Uzbekistan. Niyazov dusted off a Soviet rough blueprint for an artificial lake, Glantz and others assert, as a strongman’s way of showing dominion over nature. “Only a powerful state can build such a gigantic thing,” Niyazov said in 2003. Turkmenistan’s leader from the country’s independence in 1991 until his death, Niyazov was anointed by parliament as Saparmurat Turkmenbashi the Great and, in 1999, made president for life. Golden Age Lake was not put to public consultation or debate. “It was almost impossible to object before,” says Berkeliev. In 2004, after merely asking whether the project included ecological expertise, the country’s sole homegrown environmental group, the Katena Ecological Club, was shut down. One potential beneficiary of the lake project is the region’s archaeological treasures. “Water and salt are the main enemies of archaeological sites,” says the government scientist, who says that farmland and runoff have begun to encroach on what might be Turkmenistan’s most famous site, the Bronze Age ruins of Gonur Depe (Science, 3 August 2007, p. 586). Salinization has already taken a heavy toll at one ancient monument, Little Kyz Kala in the medieval city of Merv, which has deteriorated especially rapidly in recent decades. The water table rose, soaking the foundations of the 1400-year-old brick fortress with salt and weakening them (see photos, below). To turn a dusty depression into a lake requires a whole lot of moisture. So the first and perhaps most formidable task was to excavate the two cross-country collector canals. Specialists plotted out routes that would make best use of natural topography. “In some places we had to dig as deep as 50 meters,” says the senior water engineer. In other areas they built platforms or added boulders as obstacles to suppress the flow rate. When they encountered giant stone slabs, they invented equipment that could be inserted in cracks between layers to lift the rock out. Blasting was considered too expensive, and “we don’t have reliable professionals for that purpose,” says the senior water engineer. The crew dug the northern canal in the Dashoguz region wider and deeper to allow for a larger water flow. For about half its length, the 432-kilometer Dashoguz Collector follows the bed of the ancient Uzboy River. The 720-kilometer Great Turkmen Collector starts in the Lebap region in the east and links up with the Dashoguz Collector 75 kilometers upstream of Karashor. About 45 kilometers from the depression, engineers built a 30-meter-tall, 600-meter-long dam to steer the water; otherwise it would have followed the lower-elevation Uzboy riverbed to the Caspian Sea. The senior water engineer says his engineers have also done some “sculpting” of Karashor’s contours. Water is now moving the length of the Dashoguz Collector and beginning to flow in the Great Turkmen Collector, the senior water engineer says. Satellite images confirm this. “It looks like canals, even unlined, can convey the drainage flow,” says Leah Orlovsky, a water researcher at Ben-Gurion University of the Negev in Israel who works in Turkmenistan. On a flight from Tashkent to Tel Aviv last October, Orlovsky noticed that an area of roughly 20 to 25 square kilometers at the southern end of Karashor was flooded. Filling the lake should take several decades, says Esenov of the desert research institute. Water must first flow into the capillaries — a 1000-kilometer network of small feeder canals linking at one end to agricultural drainage ditches and at the other to small reservoirs or to the vast collector canals. Future plans call for widening and deepening both collectors, says the senior water engineer. But there are no plans to line them. He referred questions about their dimensions and anticipated flow rates to institute colleagues, who were not available for interviews. One told Science privately that the lake’s depth should reach 130 meters and its anticipated volume is 135 to 145 cubic kilometers. “Data from Turkmenistan are hard to come by ... and not so reliable,” says Glantz. But even rough approximations suggest that the project is doomed, says Berkeliev. The quality of the lake will depend on what goes into it, and Turkmen authorities in the past have predicted a water inflow of 10.5 cubic kilometers a year. About two-thirds will come from Dashoguz, including cross-border runoff from the Khorezm region of Uzbekistan; the Great Turkmen Collector will supply the other third of the water. However, Uzbekistan plans to build a drainage canal from Khorezm to the Aral Sea, so the amount feeding Golden Age Lake would eventually taper off, says Kai Wegerich, a central Asia water expert at Wageningen University in the Netherlands. “If the Uzbek drainage canal is built, it might not make sense anymore to construct the lake,” he says. Khorezm canal or no, Berkeliev says his calculations are damning. Based on the high evaporation rate in Karakum, he asserts, “there will never be a water body there.” Others say Golden Age Lake may well come into being but is fated to become an environmental nightmare: a salty broth of organic pesticides and fertilizers. Not so, says Vyacheslav Zharkov. He and his colleagues at the desert research institute in Ashgabat are devising filter media that absorb heavy metals and organic contaminants from runoff. These can be installed at treatment plants at points where water enters the collector canals — if the Turkmen government finds money to build such treatment plants. “After treating water with our sorbents, it is suitable for agriculture and for drinking,” Zharkov says. He claims that salt will be drawn out as water moves along the canals. “We have asked how the salt will be removed. They say the water will clean itself. Nobody is able to explain to me how this works,” says the Western technician. Berkeliev too says he is mystified. A complicating factor is the retreat of glaciers in the Pamir Mountains — the source of much of central Asia’s fresh water. “Eventually, there will be no Amu Darya, no Syr Darya,” Mamadsho Ilolov, president of Tajikistan’s Academy of Sciences, told Science. Golden Age Lake, he says, “will be very dangerous for neighboring countries.” The best solution to Turkmenistan’s water problems, Berkeliev and others argue, is conservation. Currently, Turkmenistan uses 5000 cubic meters of water per capita per year. That’s twice the rate of Uzbekistan and more than 10 times that of Israel. “We are the champions of water waste,” says Berkeliev. It’s high time, he and others say, that the country revises its Soviet-era agricultural system and switches to water-saving technologies, like drip or subsoil irrigation, and converts a significant portion of farmland to less water-intensive crops like wheat, corn, grapes, and olives. Berkeliev says it’s refreshing to be able to have this debate; it could never have happened under Niyazov. “But to change the minds of decision-makers, we need strong support from the outside,” he says. “We must have an international review of this project while there’s still time,” adds geographer Igor Zonn of the Engineering Research Center on Water Management, Land Reclamation, and Environment in Moscow. That might be possible, as Turkmenistan continues a cautious opening up to the world. “We are trying to increase international cooperation on environmental issues,” Ogulsona Karyeva of the Ministry of Nature Protection told a Fulbright conference in Ashgabat last month. “We would be very happy to work with foreign scientists,” says Esenov. “It’s a complex problem.” That’s something everyone can agree on.